Rockets fired at Israel from Gaza. (Washington, D.C.) — My heart is breaking over the escalating violence between Israelis and Palestinians as the situation goes from bad to worse, hour by hour. In recent days, Palestinian extremists kidnapped and murdered three Israeli teenage boys. Then Jewish extremists kidnapped and murdered an Arab teenage boy, apparently burning him alive. Meanwhile, Palestinian extremists in Gaza began firing rockets at Jewish and Arab civilians in southern Israel. More than 220 rockets have been fired at Israel since July 1st. And just since midnight, more than 100 rockets were fired at Israel. 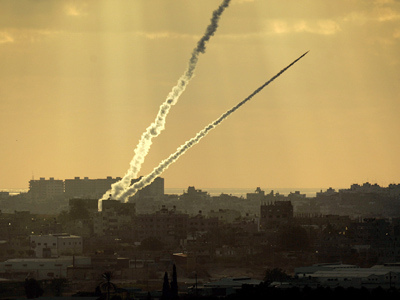 Israel’s “Iron Dome” system is shooting down many of them. The Israeli Air Force is striking Hamas and Islamic Jihad targets in Gaza. On Tuesday, Prime Minister Netanyahu and his government authorized “Operative Protective Edge” to ratchet up attacks on the terrorists in Gaza. The IDF is calling up 40,000 reservists for a possible massive ground invasion of Gaza. Please keep praying for Israelis and Palestinians along the lines I suggested in my last post. Army figures show that since midnight [Tuesday], terrorists in Gaza have fired 130 rockets at southern Israel, while the Israeli air force has struck 150 terror-related targets in Gaza. The Central and Northern commands have called up thousands of reserve soldiers, Ynet reports. Earlier, Israel approved an IDF request to call up as many as 40,000 reserve combat troops. IDF Chief of Staff Lt. Gen. Benny Gantz asked for the additional troops earlier in the day. The additional forces are slated to replace active duty battalions on other fronts, freeing them up for a possible ground incursion into the Strip as part of Operation Protective Edge. Prime Minister Benjamin Netanyahu speaks with the heads of regional council affected by the rocket fire from Gaza, telling them that they should prepare for a “long and determined campaign against Hamas until quiet returns.” The mayors Netanyahu speaks with hail from Sderot, Ashkelon, Be’er Sheva, Kiryat Malachi, Hof Ashkelon, Ofakim, Yoav, Shaar Hanegev, Merhavim, Gan Yavne, Sdot Negev and Be’er Tuvia. July 7 — Israel’s Netanyahu phones father of murdered Palestinian teen (Reuters) — “I wish to express my shock and the shock of Israel’s citizens over the despicable murder of your son,” Prime Minister Benjamin Netanyahu told the father, Hussein Abu Khudair, according to the statement. “The murderers will be brought to trial and prosecuted to the full extent of the law,” the PM added, according to the statement, a day after Israel announced that six Jewish suspects, whom it did not identify, were in custody. >> Learn more about The Joshua Fund (www.joshuafund.com). This an organization my wife and I founded in 2006 to educate and mobilize Christians to bless Israel and her Arab neighbors in the name of Jesus, including caring for the poor and needy with food and other humanitarian relief. Read our 2013 Donor Report. Please pray for our team, especially as they care for people in the rocket zone. And please prayerfully consider making a generous, tax deductible, secure, on-line contribution. « “Red Alert” app notifies you every time rocket is fired at Israel so you can pray.